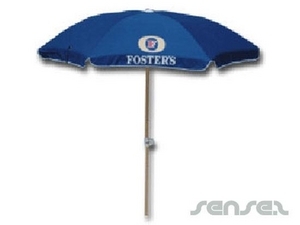 Nothing suitable in promotional beach umbrellas? How about custom branded summer event tools, logo printed corporate beach balls or one of our promotional beach towels? Custom printed promotional beach umbrellas are available in a range of colours and printed with your corporate logo or design! Promotional Beach umbrellas make the perfect innovative promotional gift because they display your logo to hundreds of onlookers and at the same time make a great useful gift.